THESE GLAMOUR GIRLS is a soapy melodrama about what ensues when a drunken college boy (Lew Ayres, who seems to have specialized in this "type") asks a dance hall girl (Lana Turner) to visit his college for a weekend of "house parties." Many in Ayres' set are wealthy snobs who turn their noses up when they find out Lana's a working girl, but she ends up teaching Ayres a thing or two about what's important in life. 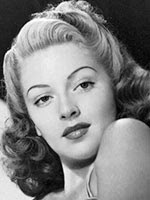 The film has a large cast, including Jane Bryan and Mary Beth Hughes as "nice" girls, Anita Louise as a witchy type, and Ann Rutherford as a bossy airhead. Marsha Hunt is moving as a girl who's becoming a little too old for college weekends and who is the object of pity as she hasn't yet caught a husband. Richard Carlson plays a young man working his way through college, about the only sensible male in the group. Later the same year Turner, Rutherford, Carlson, and Hughes would appear together in DANCING CO-ED. THESE GLAMOUR GIRLS and DANCING CO-ED were both directed by S. Sylvan Simon. Although both films feature campus hijinks and romance, the movies are as different as can be; while DANCING CO-ED is a lighthearted, comedic musical romp, THESE GLAMOUR GIRLS concerns "mean girls," family financial calamities, a car parked on train tracks, and other unpleasant matters. I didn't find THESE GLAMOUR GIRLS as diverting as DANCING CO-ED, but it's still entertaining, and is particularly worth seeing due to the interesting cast. Jane Bryan, who plays Carol, a girl agonizing between marrying for love or money -- a good financial match would rescue her family's finances -- would later marry Justin Dart and retire from the screen. Justin Dart was one of Ronald Reagan's closest friends and advisors. THESE GLAMOUR GIRLS runs 79 or 80 minutes and was shot in black and white. The trailer can be seen at the Turner Classic Movies site. Summer 2010 Update: THESE GLAMOUR GIRLS has now been released on DVD-R format from the Warner Archive.